The amount of smuggled ivory tracked down in China fell 80 percent in 2016 from previous peak years, the State Forestry Administration (SFA) said Sunday. Liu Dongsheng, deputy head of the SFA, made the remarks at the opening ceremony of a wildlife protection campaign, without specifying detailed numbers. China will stop commercial processing and sales of ivory by the end of this year. Last year, it imposed a three-year ban on ivory imports in an escalated fight against illegal trading of wild animals and plants. 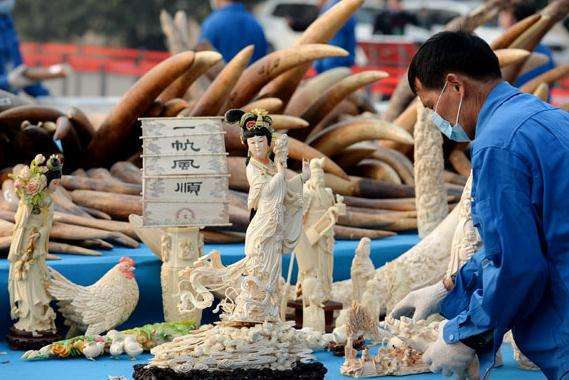 The number of illegal wildlife trade cases has been on the decline since last year, said Liu. Meanwhile, the numbers of critically endangered species in China, including giant pandas, crested ibis, Yangtze alligators and Tibetan antelopes, have been increasing steadily, he said. China's newly-revised law on wild animal protection took effect at the start of this year, imposing harsher punishment on overkilling and illegal utilization of wild animals. The amount of smuggled ivory tracked down in China fell 80 percent in 2016 from previous peak years.